Seamless solar roofing inserts will revolutionise the way solar energy from the roof is harvested changing all the rules of the past. 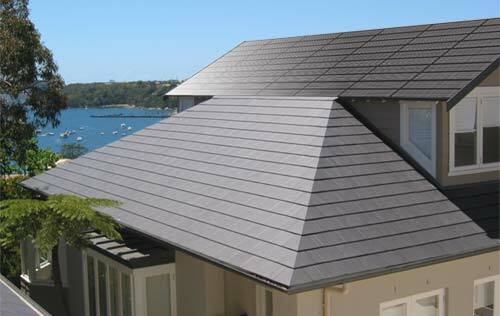 Whereas previously solar energy deriving panels were attached on to the top of the roof, Seamless solar inserts actually become part of the roof becoming a part of the the contour lines of the roof rather than destroying them, as so many unsightly solar panels did in the past when they were bolted on to the existing roof. Seamless solar inserts convert light directly into electricity saving approximately 450kg of carbon dioxide emissions per year for each kW peak installed (kilowatt (kW) peak- PV cells are referred to in terms of the amount of energy they generate in full sunlight). Many home owners will install sufficient solar inserts to power their entire home (4kW+) taking a huge weight of use from the national power grid. No matter what size (roof area) of Seamless solar inserts that you install you will enjoy the benefits of solar energy from day one. Producing clean electricity directly from your roof system. Apart from the obvious financial benefits, you will enjoy the personal contribution to global clean air you give. Making our planet a better place for our children in the decades to come. As of the 1st January 2010 all energy that is generated from your solar system is now credited to you at 60 cents per Kwh for at least the next seven years (1 Kw system should produce on average 4Kwhs per day 1460 per year) this means that no matter how much you invest in a Roofsolver solar system it should pay for itself in 8-10 years and after that its all free electricity. Why not have your roof working for you every day of the year. Either way the decision to harness the energy from the sun could be the most valuable contribution ever made by the earth’s population.